While total joint replacement can be performed on a variety of joints in the body, including the ankle, shoulder, fingers, and elbow, the most common joint replacement relates to hip, knee and shoulder replacement. Joint replacement surgery is a specialty unto itself. Because infection involving the bone can be disastrous, the operating suite must be set up for joint replacement to lessen risk of bone infection during the surgery. Joint replacement surgery is best performed by specialists who are board-certified orthopaedic surgeons. This training enables the physician to include non-surgical treatment options to relieve joint pain, or use less invasive surgeries that can relieve joint pain symptoms and restore motion. When all those options have been exhausted, then the joint replacement surgeon will consider and advise complete replacement of the damaged joint with an artificial joint implant. 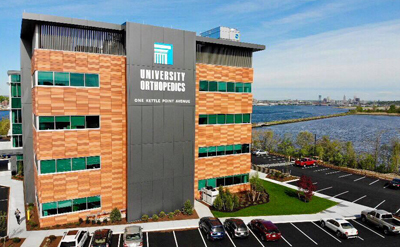 The specialists at the Joint Replacement Center at University Orthopedics are also trained in minimally invasive joint replacement surgery, and make use of the most advanced surgical implants. Working a lifetime should reward a person in retirement with activity and recreation. However, for many people approaching retirement, dreams of activity clash with the reality of daily hip pain. As a person ages, for some people in their fifties, sixties or seventies, arthritis can cause the hip joint to become pitted to the point that walking or any movement can become excruciating. Hip arthritis can produce an incessant dull and aching pain that may be constant or it may come and go. Pain can originate in the thigh and buttock, but can also travel into the knee. While the pain related to hip osteoarthritis usually starts slowly, it worsens with time until the person is extremely limited, usually unable to climb stairs. Even activities of daily living — dressing, tying shoes, etc. — can be an excruciating challenge. Thanks to hip replacement surgery, most people however are able to quickly regain function with the implantation of an artificial ball and socket joint in the hip. According to the American Academy of Orthopaedic Surgeons (AAOS), each year nearly 250,000 hip replacement surgeries are performed with the goal of helping patients regain their ability to walk and play their favorite recreational sport. The first hip joint replacement was done in 1940, and the procedure has continually advanced to become one of the safest and common orthopedic procedures with the vast majority of patients coming out of the surgery with a restored ability to walk or jog without pain. Hip replacement surgery replaces the surfaces of the joint that glide over each other. In the ball-and-socket joint, the ball is replaced with a ceramic or metal ball. An incision is made in the beauty of the patient. The surgeon then removes the diseased bone and cartilage. The socket is smoothed down and a metal cup with a plastic, ceramic, or metal liner is placed into it. The surgery itself, lasting between two to three hours, is performed on those who experience the chronic and debilitating effects of hip disease. When the knee joint has been damaged beyond repair of ligaments or meniscus tissue, pain can become unbearable, and motion stops. Walking can become excruciating, and stairs can become an insurmountable obstacle. The most common cause of a knee replacement is arthritis which damages the surface of the knee joint until the sensation is that of painful bone-on-bone friction as the knee joint moves. Compounding the problem is that more than half of Americans are classified as “overweight” and one in four is now “clinically obese.” Fact: The human knee was never designed to prop up and propel a 300-pound object in motion. Consequently, each year in the U.S. there are more than 500,000 total knee replacements and that is expected to increase with the aging of the baby boom population. Interestingly, of all knee replacements, about 65% of these knee replacement patients are women. Just as the chrome on a trailer hitch can get pitted with age, so can the joint surfaces become pitted and damaged in the knee joint. While knee replacement surgery has become somewhat commonplace, most knee replacement surgeons are cautious with young patients with bad knees who may be eager to swap out a painful knee joint for an artificial knee joint. Consequently, knee replacement is held out for those who can’t respond to other treatment options, and surgeons are quick to advise patients to lose excess weight in advance of knee replacement surgery. In knee replacement surgery, the top of the tibia (shin bone) and the bottom of the femur (thighbone) are shaved off to accept the artificial knee joint. While the procedure takes one to two hours, rehabilitation after the surgery can take several weeks. After surgery, most patients are advised to avoid any contact sport that could cause trauma to the joint. Total knee replacement is reserved for the patient who has not benefited from conservative treatments and whose quality of life is suffering due to the debilitation caused by knee pain. Knee replacement is also generally reserved for those who are over 50 years of age who are in relatively good health. For the wrong person, knee replacement surgery could prove counterproductive and disastrous. Those who are too young (except for those who suffer from severe rheumatoid arthritis) should consider other types of treatment for knee pain. In revision knee replacement surgery, the bone is cut shorter to make room for the second knee implant, and function is likely to be affected. Uni-compartmental knee replacement is a minimally invasive surgery that removes and resurfaces damaged articular cartilage in a single area of the knee. The goal of this procedure is a quick return to activity and pain relief. During the surgery an incision is made and the surgeon removes the arthritic surface at the end of the thigh bone or femur and prepares the bone for a new covering. Then the femoral component is attached, and the arthritic surface on top of the shin bone is removed. A metal tray (tibial tray) is placed on top of the remaining bone, and the tibial insert is locked into the tray. The main benefit is that the patient maintains two-thirds of the natural knee and pain relief is accomplished through minimally invasive techniques. The ultimate goal of knee joint replacement surgery is to restore motion to the person with badly arthritic knees so they can return to walking and many recreational sports. For many, knee replacement surgery provides a way back to golf, tennis and other activities. Arthritis or injury can also damage the shoulder joint preventing a person from lifting their arm. In severe cases, the only treatment available is shoulder joint replacement surgery. University Orthopedics performs both “shoulder replacement” and “reverse shoulder replacement” surgery. Shoulder replacement surgery has been around since the 1950s and was originally used for severe fractures, but because of its success, it has since been broadened to address arthritis. Today, about 23,000 people in the U.S. have shoulder replacement surgery. Patients with bone-on-bone contact are typically good candidates for shoulder replacement surgery, where an artificial ball and socket joint is installed into the shoulder. Reverse shoulder replacement is another variation that was developed in the 1980s. This is used for those with completely torn rotator cuffs or have had a shoulder replacement surgery that did not relieve symptoms or restore motion significantly. In reverse shoulder replacement surgery, the position of the ball and socket are “reversed” where the ball is applied to the shoulder and the plastic socket is attached to the upper arm. This enables the person to lift the arm using a different muscle than the rotator cuff. Our Joint Replacement Center team specializes in finding the most appropriate treatment for all types of joint problems. We are referred some of the most complex cases in the region. Although we are proficient in the latest surgical techniques for less invasive and minimally invasive joint replacement surgery, we believe joint replacement should be considered after nonsurgical options have been exhausted. By exploring conservative treatment first, patients are better able to recover from arthritic or damaged joints and return to an active lifestyle.